Antwerp Port Authority and Energy Recovery Systems Company Ltd. (ERS) have decided by common consent to cancel the option held by the company on the Churchill site. ERS informed the Port Authority that it needed more time to reach the milestones imposed by the Port Authority, which means that the option it obtained from the Port Authority last year will expire. Despite this ERS is continuing to work on the project for a Waste-to-Chemicals (WtC) plant that it wants to build in the Antwerp port area. Keppel Seghers Belgium N.V. and Keppel Seghers UK Limited (collectively, Keppel Seghers) have handed over Phase 2 of the Runcorn Energy-from-Waste (EfW) facility, in the UK, to the client. Runcorn EfW comprises two phases of equal capacity. Phase 1 is owned by INEOS Runcorn (TPS) Limited (TPSCo), a joint venture between INEOS, Viridor and John Laing. Phase 2 is owned by Viridor EfW (Runcorn) Limited, a special purpose vehicle owned by Viridor Waste Management Limited. Keppel Seghers handed over Phase 2 to the client on 24 April 2015 after successfully completing a 30-day reliability test. With growth of 5.9% the port of Antwerp has got off to a strong start in 2015. In terms of container handling (in TEU) Antwerp even achieved growth of 9.5% in the first three months of this year. The 2M alliance of MSC and Maersk which last year opted resolutely for Antwerp is of course not unconnected with these growth figures. During the next few months preparations will be finalised for transfering the activities of the MSC shipping company – currently operating in the Delwaide dock on the right bank area of the port – to the Deurganck dock on the left bank of the Scheldt. Mitsui O.S.K. Lines, Ltd. (MOL) has signed a contract covering construction of four next-generation "FLEXIE" car carriers at Minaminippon Shipbuilding Co., Ltd. To be delivered in 2017 and 2018, the ships will serve on on MOL's worldwide car carrier services and will offer increased capacity and a new deck design for more flexible loading. Deck construction of the newly-ordered car carriers will be substantially altered to change the number of decks from the current 12 to 14. Furthermore, the number of liftable decks will be increased from two to six. Greater energy efficiency and safety increasingly determine the selection of electric drives, even at high levels of power. With its IndraDrive CL/ML, Bosch Rexroth now offers a scaled product range of strong drive solutions from 110 kW to 4 MW for applications in metal forming, plastics, test, printing, metallurgy, marine, offshore and other heavy industries. 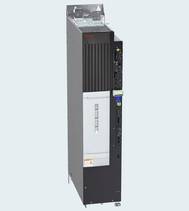 These drives open up numerous opportunities for users to improve energy efficiency, especially through power regeneration. As ship owners and operators continue to be pinched by high fuel prices, Alfa Laval says it is raising the bar when it comes to solutions. Drawing on the industry’s broadest portfolio of equipment and knowledge, Alfa Laval is taking a comprehensive approach that promises sweeping advances in energy efficiency. 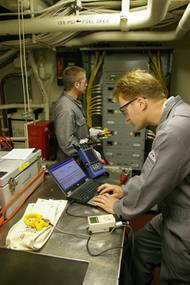 Today’s marine industry is placing greater emphasis on energy than ever before. This comes as no surprise, since virtually all energy at sea comes from the burning of fuel. Kone eco-efficient elevators and escalators to serve another TUI Cruises vessel, 'Mein Schiff 4'. The new cruise ship will be the sister ship of Mein Schiff 3, which will also have Kone's solutions installed onboard. Both vessels will be built at STX Finland, Turku shipyard, the former being set for delivery in the spring of 2014 and the latter in the spring of 2015. Kone's People Flow® solutions will facilitate the smooth and efficient movement of 3,500 passengers and personnel onboard the Mein Schiff 4. Alaris Helps USCG "Go Green"
Alaris Companies (Alaris) is helping the U.S. Coast Guard to save taxpayer dollars, decrease energy usage, and reduce greenhouse gas emissions with a unique fleet energy management program. Working under a previously announced Michael Baker Jr., Inc (Baker) Department of Homeland Security - Coast Guard contract for Architect / Engineering Services, engineers from Alaris completed an assessment and report for the 110-ft Patrol Boat (WPB) and 225-ft Seagoing Buoy Tender (WLB) class of cutters. Dresser-Rand Selected Supplies UA Shipping Co. The United Arab Shipping Company has selected Dresser-Rand Company Limited, a subsidiary of Dresser-Rand Group Inc. (NYSE:DRC) , to supply turbo-compound energy recovery power gen6eration systems on board their new vessels being built by Samsung Heavy Industries of Korea . 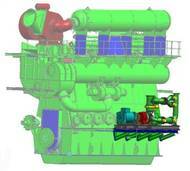 As previously reported, Dresser-Rand booked an order in October 2009 comprising nine steam turbine generator sets. The equipment will be manufactured at the Company's Peterborough facility in the United Kingdom, which was acquired in 2008. Deliveries are expected to begin during the second quarter of 2010.